My Mom,Ruth Marcus Williams, was born 80 years ago this Thursday on July 2nd,1929 and passed away 25 years ago this Sunday July 5th, 1984 at age 55. I am now almost as old as she was at the time she passed. We had our differences, to be sure, but beneath it all we really loved one another very much. Perhaps it was our similarities which made things so difficult at times. She could be stubborn, like me; obtuse, like me; and at times, unreasonable; like me. She was the product of a broken marriage- she was born after her parents seperation in 1929, although the divorce did not become final until 1934. There was money to fight over and my Grandmother was a shrewd woman. My Grandfather, Pincus Max Marcus, was a self made millionaire 3 times- and lost it all each time to the horses and the ladies. This was the reason for the divorce. She caught him, flagrant delecto, in the late spring of 1929- 4 weeks before the birth of my Mom on July 2nd and 3 months short of Black Tuesday when the market crashed, triggering the Great Depression. Grandma Dorothy, as I said, was a shrewd woman and she exacted quite a price from Pincus for his indiscretion. Here she was, 8 months pregnant and initiating a divorce at a time when Divorce was a whispered word that carried many unwanted conotations. But she was determined to make the break. While waiting for the divorce proceedings to begin she extracted a settlement from him in the form of $250,000 in Treasury Bonds. Quite a sum in pre Depression 1929 - and a fortune 3 months later when Pincus begged her to lend him some of it back to shore up his losses. She did- at interest. So my Mom grew up without a father and with a Mother who was often absent, touring the world,socializing and traveling. 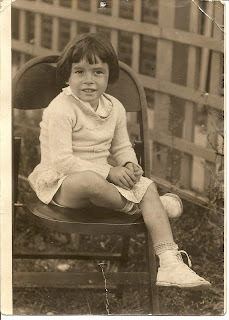 My Mom had all the privileges of a spoiled child in a 1930’s movie. She learned piano, took voice lessons, horseback riding instruction, went to summer camp every year and never really wanted for anything- except a father. She was considered a pretty woman, although as her son I would not be the best judge of that, she was just Mom to me. But when she would play the piano and sing inside our Brooklyn apartment, the neighbors would gather outside the door and listen to her, exchanging comments like “Oy, what a voice- she should be on the stage!” And she would have, if she hadn’t met my Dad. She was slated to tour with a road company of "Oklahoma" in 1949 and my Dad was about to join the Mechant Marines (which I would do later) when they came to an impasse. If she toured he would sail and that would be the end of that. Fortunately for me, they both gave in. So now it is 80 years since my Mom was born on July 2nd, 1929 and 25 years since she passed away on July 5th, 1984. Lots of time to think back on things since then. We spoke a few days before she passed- she had been ill my entire life. This is what she told me in that last conversation by phone from a pier in Norfolk, Virgina- “You know Robert, you can never go on with your life until mine ends- you’ve been a prisoner of my illness for so long.” I replied that I knew that and perhaps it was the reason I went to sea for almost a decade- to get away from the marathon of her dying. We closed out all business and in 25 years I have never had a bad dream about her. So in way of a tribute to her I would like to post the following story she wrote a few years before her passing. It’s about her Dad Pincus Max Marcus and the void she always felt concerning his absence. I hope you enjoy it. Daddy Doesn’t Sleep Here Anymore. Thursday was our maids’ night off. My brother and I then played a game we called “sneak.” It consisted of sneaking out of bed, running wild, and generally harassing our mother. As my brother was 5 years older than I, he got the brunt of my mothers wrath. “Not tonight,” my brother said. “Because Mommy’s crying,” he replied. It was then that I saw my mother pacing up and down the long foyer of our apartment, crying. “Mommy and Daddy got divorced today and Daddy got married to a Gold digger,” continued my brother. “What’s a Gold digger?” I asked. “Someone who marries someone for their money,” he said. And so, still not understanding a word he had said, I went to bed. Afterward, the only thing strange to me was when I would visit other peoples homes and see one enormous bed! I couldn’t figure out why they had one and we didn’t. Finally I asked my brother and he explained that those were called double beds and were for married people. I thought it peculiar that a man and a woman had to sleep in the same bed when they got married. I thought it would be nice to have such an enormous bed just for myself. “Oh, my mother and father are divorced,” I said with a casualness I didn’t feel. Instead, I felt ashamed. In the 1930’s divorce wasn’t as common as today. In fact, I didn’t know anyone whose parents were divorced. Thereafter, unless I was pinned down, as I was that day, I never told anyone that my parents were divorced. I knew damn well he was there- it was just a question of whether he was in the mood to see me. More often than not she would come back saying, “I’m sorry, he left.” Then I’d leave feeling good for nothing. Other times when I’d been told he wasn’t in, my father would come flying out of his office just as I was about to enter the elevator. Fighting back tears I’d say, “ I could always use some.” Then he would give me fifty or a hundred dollars. Damn it, I’d think, I don’t want his money; I want his love. If my own father doesn’t love me, who will? Sometimes though, after checking, the secretary would say, “ Your father will see you now.” As I would enter his office, shaking from nervousness, he’d inevitably be on the phone and wave me to a seat. While he continued his conversation I’d study him- this enigma of a man who by blood was my father. Did I look like him? Did we have any traits in common? What would it be like to live with him? Question after question spun through my head. Between calls he would scrutinize me , and at one time or another he would say, “Your hair is messy.” Or “ Your voice is too high pitched.” Or You’re wearing too much lipstick.” Or “ You’re too skinny.” Or “You’re too sensitive.” No matter what- I would leave that office feeling worthless.